Hmmm.....Guess nobody's home. But what do you expect. It's not called a ghost town for no reason. 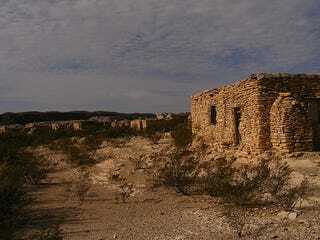 What is a ghost town, you ask? Well, it's a good thing I'm here to tell you. (puts on preachin' hat k2b made me....). A ghost town is simply a town that no one lives in anymore. Old time westerns used them a lot. So did cheap horror movies. But they are a real thing. Here in America, whole sections of Detroit have been rendered into a ghost town. Old mining towns, old industrial towns, contaminated towns. The list goes on. Yep. I said contaminated towns. Who here remembers Love Canal, New York? Or the city of Chernobyl. Or Fukushima. A town doesn't need to be old to be a ghost town. It doesn't have to be modern, either. Machu Pichu is a ghost town. So is Pompeii. There are many reasons why a town gets deserted. The one I pictured is in Texas. But they are all over the world. I'd be willing to bet almost every country has at least one. Yesterday I asked about two mines that were lost in WWI. I was telling the truth. On June 17, 155, one of them was sparked by a thunderstorm and blew up a cow. And the Brits think they know where the other one is, but haven't gone looking for it. Apparently it's in a location where no one would be injured if it detonated. They think. They aren't actually sure of the location. So it could be sitting under someones house. Their rationale is, if it is where they think it is, they could set it off just by looking for it. Anyhoo......back to todays subject. Ghost towns. No. That's not right. I know it involves towns, but not the ghost kind. That must mean someone still lives there. So it must be about towns. That sounds right. If it isn't, well....so what. I'm going to go with towns. Old towns at that. Ok, remove the 's' and make it singular. Old Town. This is a post about an old town. The oldest, continuously inhabited town in America. If you were to guess, most of you would guess a town on the East Coast. One of the first English settlements, like Jamestown, or even Boston. Maybe New York. Some of you might guess one of the old Spanish settlements. like St. Augustine. The town in question has a current population of 4,989, and it sits in New Mexico. The town is called Acoma Pueblo, and it actually is comprised of three smaller villages; Sky City, Acomita and McCartys. It sits on the Acoma Reservation, which is listed as a National Historic Landmark. The Acoma are descended from the Anasazi. No one is sure what happened to the Anasazi, other than they disappeared. It's thought that changes in the climate forced them to move on, but if that's true, why did the Acoma stay? Chances are, the climate changed just enough so a large population couldn't be sustained. This led to unrest among the Anasazi, so starting in the 13th century, they started migrating away. The Acoma however, didn't live with their neighbors in the canyons. They lived on top of a 365 foot mesa. Their population was small enough that they didn't have to move on, and kept them sheltered from the unrest. They first occupied their mesa in 1150, or so. And people have lived there continuously for almost 900 years. And their mesa kept them out of reach of the Navajo and Apaches. (for the most part). Up until a couple of hundred years ago, the only way to access the mesa was by climbing a steep set of steps carved into the side of the mesa. This kept most people out. But not the Spanish. In 1540, Coronado's expedition came upon the mesa, and they climbed up. He declared it one of the strongest places he had ever seen. But the Spanish, being conquistadors and all, just couldn't leave well enough alone. In 1598 Juan de Onate decided he wanted to take control of a large swath of land that just happened to include the Acomas pueblo. And when the Acoma defended their right to not be under Spanish rule, the Spaniards did what the Spaniards did best; kill, burn, enslave. About 1100 Acoma were either killed or enslaved. Onates men destroyed much of the pueblo. But not all. If you go there today, you'll see three houses, still being lived in, that have battle marks from that fight in 1598. By 1620, Catholic mercenaries....I mean missionaries, were swarming the region, forcing their religion onto the natives. They brought with them small pox, the Navajo and the Ute. And while the Acoma suffered, they prevailed. That's why, to this day, you will find Acoma living on their mesa. Just like they have for the last 900 years.